The News Sentinel soon will be appealing TVA’s denial of a Freedom of Information Act request seeking the specifics of a subsidy the agency is giving a South Korean auto parts manufacturer expanding its operations in Clinton. Gov. 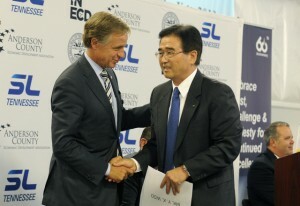 Bill Haslam shakes hands with Y.K. Woo, president of South Korean auto parts maker SL Americam after an announcement of expansion of its Clinton plant. TVA contributed a hidden amount of incentives to the deal. The response ignores the fact that TVA is a public agency and the resources it is providing — to a private company — are public resources. All of the other government agencies contributing incentives to the Clinton expansion made public what their subsidies were. But the administrators of TVA have determined that their need for managerial flexibility outweighs the citizenry’s need to evaluate how public resources are being deployed. It’s worth keeping in mind that TVA’s CEO, Bill Johnson, is the nation’s highest paid federal official, pocketing a compensation package worth $4.6 million in fiscal 2014 and landing a raise last month that will let him earn nearly $1 million more in 2015. The agency also announced last month that it would be awarding $131 million in year-end bonuses to employees, an average of nearly $11,400 each. In justifying its largess, TVA noted that it helped lure some $8.5 billion of new investment to the Tennessee Valley in the past year, which is supposed to add 60,300 new jobs. What public resources did TVA exchange for that economic investment? That’s a secret the agency says the people have no right to know. This entry was posted in Uncategorized on December 2, 2014 by Jack McElroy.